Ahead of next week's NAMM convention, Denon has announced the brand-new Prime 4, a powerful, four-deck DJ performance system. It has numerous features that will appeal to DJs looking to mix between a huge library of tracks, filter and effect them, and cut, loop, and otherwise manipulate their music. 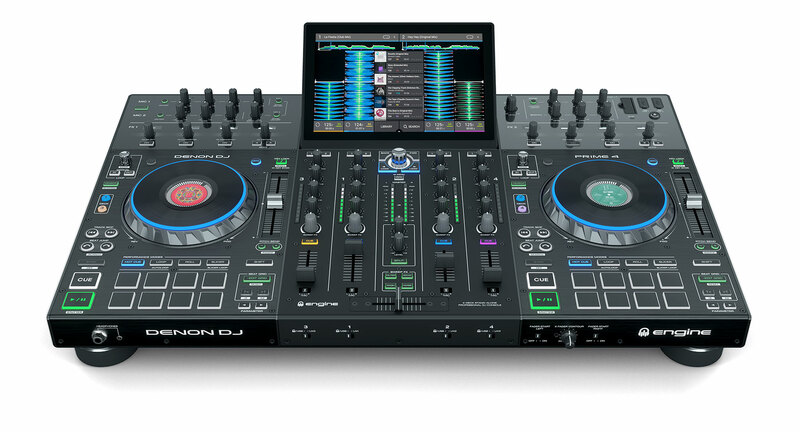 The Prime 4 gives DJs complete, tactile control through four decks and a 10" touchscreen, where you can access, edit, and effect your tracks, all without a computer. You can load a huge amount of music onto the Prime 4 and record your sets through any of the four USB ports, an SD drive, or a built-in 2.5" SATA drive bay. You can use any of these channels to record your sets. The unit's four channel line faders each have a three-band EQ. You can add textures and character through any of the 13 included effects, and there's a dual-function sweepable effects and filter control. Through the USB ports, you can also add a keyboard controller for added versatility. Additionally, Denon has created what it's calling the "world's first" independent Zone Output, allowing you to play a playlist in a separate room while performing on a main stage. Check back soon for availability. For all the latest product releases coming out ahead of next week's NAMM convention, check out our ongoing NAMM 2019 coverage.